One of YouTube's most endearing content creators is making a cameo in the next Elder Scrolls game. 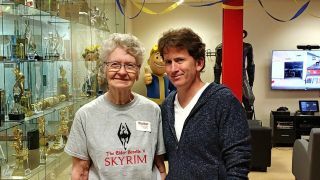 Shirley Curry – called 'Skyrim Grandma' by her fans – is an 82-year-old gaming enthusiast and dedicated Skyrim fan, with a popular YouTube channel that's racked up over half a million subscribers for her Elder Scrolls play-throughs. Curry took to Twitter this week to announce she would appear "as a character in the next TES game", posting a video in an Elder Scrolls shirt next to a smiling Todd Howard – the Bethesda director who oversees development of the Elder Scrolls and Fallout series. Putting real people in games is different than using the standard character creation tool, however. We learnt more about Bethesda's use of 'photogrammatry' tech at PAX East (when Gearbox also officially announced the upcoming Borderlands 3 game), during the Elder Scrolls 25th Anniversary Panel. The tech allows Bethesda to take measurements of real-life faces, objects or surroundings in order to recreate them within the Elder Scrolls VI game engine. As the mo-cap tech used in video games progresses, it could be we see more and more real-life people and well-known faces appear in our games. In March this year we also caught wind of Lady Gaga apparently playing a character in CD Projekt Red's Cyberpunk 2077.